I’m a mega-fan of throw pillows, blankets and accessories in home decor. I love to DIY them and I LOVE to use them to change the look of my furniture and my living spaces. 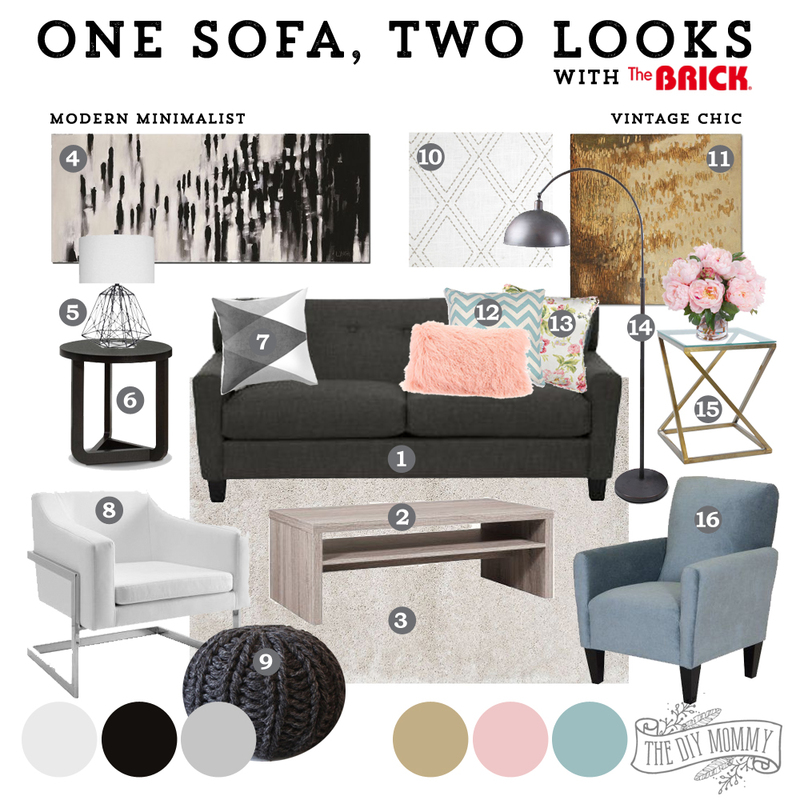 Today, I’m sharing with you some decor inspiration for Spring using one sofa but styling it two ways for two different types of decor – vintage chic and modern minimalist. Here we have one gorgeous, neutral coloured sofa (this is the Aubrey sofa) that looks right at home in both a minimal-modern setting (on the left) and an eclectic vintage setting (on the right). Isn’t it so neat how a couple of different accent chairs and accessories can change the entire feel of this room? The Aubrey sofa is part of The Brick’s It Fits collection – a stylish collection of furniture that’s made for smaller spaces. Like this beautiful sofa, these pieces are on trend and perfectly proportioned for your home. The It Fits Collection has been developed for the space and budget conscious consumer of any style! Which of these items is your favourite? Would you like to see them in person?! I’m so excited to announce that I’ll be presenting at the Edmonton Home + Garden Show this Spring and the main stage will be furnished with these pieces along with some of my own DIY accessories! Are you curious to know what the trends are this year in home decor? Do you want a stylish look to your home but have a limited budget? With help from The Brick, I’ll be sharing with you some of 2016’s most exciting trends in home decorating along with some design and DIY secrets on how you can execute them on a budget. Whether your style is vintage chic or modern minimalist, you’ll learn how to get high style results at a low price point. Come say “hello” and check out these furnishings during my presentations on Saturday, March 19th at 11am and 7pm and on Sunday, March 20th at 1pm. You can find all of the show details here. I hope to see you there! How fun for you to be at a home show! I love the idea of this brand, that gold table is stunning, and I have a soft spot for poufs of any kind! We are in the process of shopping for a new sofa right now so your post is timely. I love the side chair. Visiting from The Creative Corner. Hi Christina! What a gorgeous room you put together! I’d love to know how you put together your mood board? Did you just do it in Illustrator (or other design program) or is there somewhere online you did it?